The boat capsized while sailors were training Thursday in the bay just north of Treasure Island. 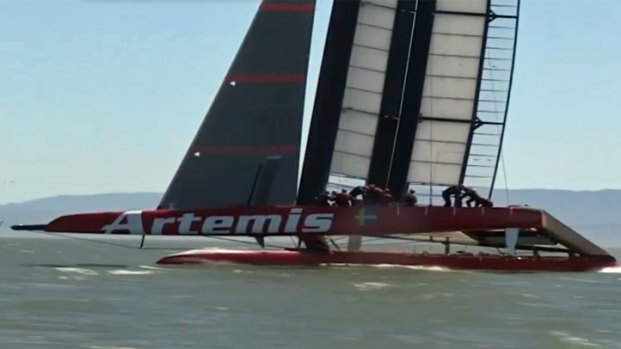 Training was canceled on Friday and Team Artemis was in mourning after an Olympic sailor from their crew died when an America's Cup sailboat capsized during a training run in the San Francisco Bay. A news conference on Friday at Pier 27 in San Francisco did not shed much light on what happened just before the death of British-born Andrew "Bart" Simpson. A sailor died Thursday when an America's Cup sailboat named Artemis Racing capsized during a training in the San Francisco Bay, north of Treasure Island. NBC Bay Area's chopper was overhead after it happened. Regatta Director and America's Cup Management CEO Iain Murray said that officials have not yet talked to the team about why the catamaran, "Big Red," took a "nosedive" Thursday about 1 p.m., catching Simpson underneath for about 10 minutes, because they are grieving. Murray vowed they would find out what happened, and said that sailors are taught to "respect the ocean at all times." Simpson, the 36-year-old Olympic gold medalist, was the team's strategist. He had won gold in China in 2008 and silver in 2012. 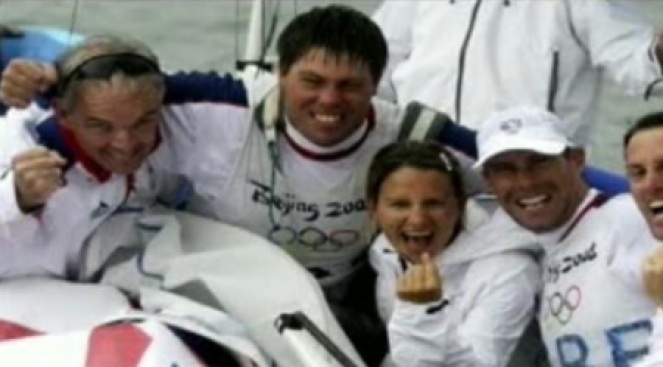 "He was the heart and soul of the team," said Tim Jeffery, Oracle Team USA spokesman said Thursday. "He was perpetually happy. It was like he had a little box inside that gave him a sunny outlook on life." Simpson joined the team in February, providing his crew with weather and tactics support, according to the America's Cup website. Jeffery said Simpson's worth to the team was his ability was to "spot the breeze, read the breeze." Magnus Auguston, the team's "grinder," said Simpson was was of the "finest guys I ever met," and a wonderful sailor, as well as husband and father. And the British Olympic Association described him as a "treasured and accomplished member" of its teams. On Friday, the same website showed dark gray clouds hovering over the Golden Gate Bridge, near where Simpson died on Thursday, with a quote from the Swedish team's CEO, Paul Cayard, simply stating, "Our prayers are with Andrew Simpson's family." He added that Artemis Racing will conduct a thorough analysis and review of this accident and will be looking at how the risks inherent to such competitive sailing can be limited in the future for the safety of the team and all competitors in the sailing community. Crews performed CPR on Simpson for about 20 minutes, after the accident in the San Francisco Bay just north of Treasure Island, according to San Francisco Fire Chief Joanne Hayes-White. But just before 2 p.m., fire paramedics stopped life-saving efforts. He had been in the water for about 10 minutes, probably trapped under the AC 72 vessel, Hayes-White said. It's unknown why the boat capsized. San Francisco police will lead the investigation into what happened. This is the same major accident investigations team that investigated an accident during a yacht race off the Farrallon Islands last April that killed several people. In that race, unrelated to the America's Cup, the crews were racing a 37-foot Aegean off the coast of California and Mexico, when it collided with a larger vessel. Winds at the time of Thursday's accident show the average gusts to have been between 25 mph and 35 mph, waves between four to six feet high, and water temperatures about 55 degrees -- nothing out of the ordinary. Eleven other sailors were aboard the 72-foot long craft, and the other 10 were taken to a support boat operated by Oracle Racing, which is defending the America's Cup title from 2010 in San Francisco this summer. Another team member, identified on Friday as Craig Monk, a "grinder," suffered some cuts and was bandaged and released, according to America's Cup officials. Artemis Racing is the "challenger of record" for the 24th America's Cup. Sailing in the San Francisco Bay is both exhilerating and dangerous — mostly because of the winds. "It has ideal winds," said Rich Jepsen, of OCSC Sailing in Berkeley. "But at that speed, there is no room for error." Seventy-two-foot catamarans like the Artemis can travel between 40 to 50 mph. This it is the third America's Cup training accident — though the first fatal one — in the last two years in the San Francisco Bay. And in 1999, there was one other America's Cup fatality: Martin Wizner of the Spanish Challenge died almost instantly in Valencia, Spain when he was hit in the head by a broken piece of equipment. 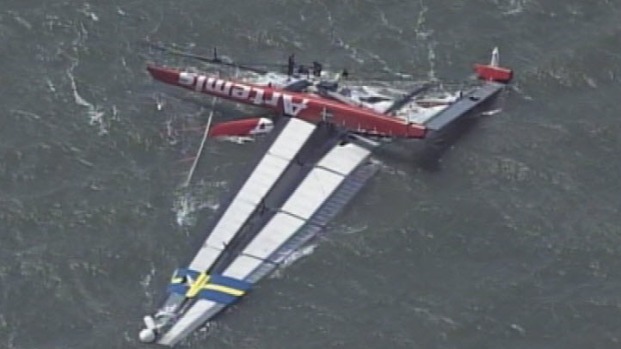 Back in October, a nearly $8-million, 72-foot catamaran used by Oracle Team USA capsized near the Golden Gate Bridge. No one was injured when that happened. But there was at least $2 million in damage to the wing of the AC 72 boat, a massive vessel with a 13,000-pound hull and a 131-foot mast. There was another accident in June 2011, with the same Oracle team. Artemis has had technical problems, as well. Last fall, Artemis said the front beam of its AC72 catamaran was damaged during structural tests, delaying the boat's christening. A year ago, Artemis' AC72 wing sail sustained serious damage while it was being tested on a modified trimaran in Valencia, Spain. The America's Cup race is scheduled to run from July through September, and the teams are training on the bay in specially made 72-foot catamarans. Photos and updates were also available on the America's Cup website.To see the members of the Artemis Racing team, click here. The America's Cup is considered sailing's most prestigious event and, along with the Olympics and World Cup soccer, among the world's largest global sporting events in terms of its economic impact. It began in 1851 when the New York Yacht Club's schooner, `America,' bested the British off the coast of England. The winner is responsible for choosing the site of the next race and making arrangements for it. Software billionaire Larry Ellison's Oracle Racing won the cup in 2010 off the coast of Spain. Ellison, who won the cup representing the San Francisco-based Golden Gate Yacht Club, chose the San Francisco Bay. After organizers predicted about a dozen entries, only three competitors signed up to challenge Ellison for the America's Cup. They are: Artemis, which is representing the Royal Swedish Yacht Club; Luna Rossa Challenge, representing the Italian yacht club Circolo della Vela Sicilia and Emirates Team New Zealand, representing the Royal New Zealand Yacht Squadron. Competing teams can spend more than $100 million to construct and race the space-age 72-foot dual-hull boats. The three challengers will compete in a series of match races beginning July 7. The top two finishers will compete in a best of seven semi-final starting Aug. 6. The first to four victories will take on Oracle Racing starting Aug. 17. The finalists will race twice-a-day in a best-of-13 series. The first to seven wins is champion. Organizers boast the 34th America's Cup will be the most accessible to on-shore spectators in the event's history. The compact course stretches from inside the Golden Gate Bridge, past Alcatraz Island to Piers 27 and 29 along San Francisco's busy waterfront district, circling in front of the city's iconic Fisherman's Wharf area. NBC Bay Area's Stephanie Chuang, Cheryl Hurd, Kyle Bonagura, Tim Bollinger, Gonzalo Rojas, Jean Elle and Jeff Ranieri contributed to this report, as well as the Associated Press.